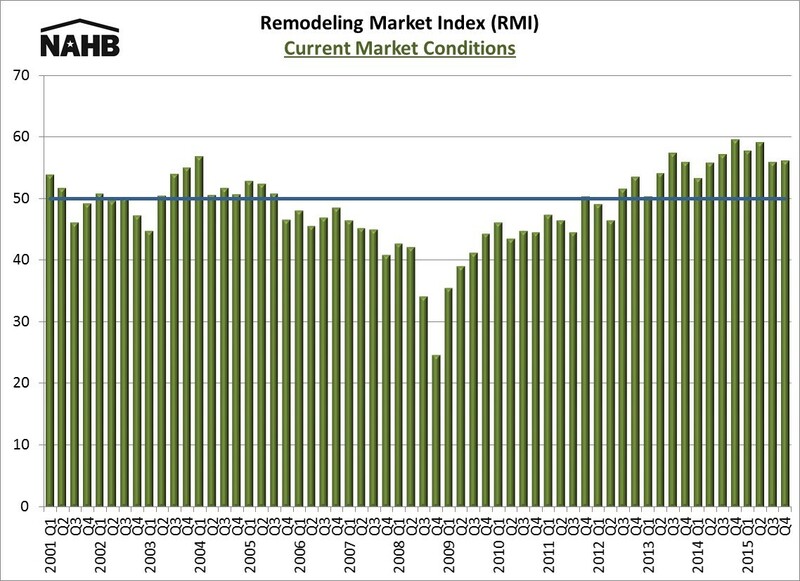 The National Association of Home Builders’ (NAHB) Remodeling Market Index (RMI) posted a reading of 58 in the final quarter of 2015, one point above the previous quarter. This was consistent with similar results over the past year and a half, indicating sustained confidence in the market from remodelers. The RMI and all its components lie on a scale of 0 to 100, where an index number above 50 means more remodelers report that activity has improved (compared to the prior quarter) than report activity has deteriorated. 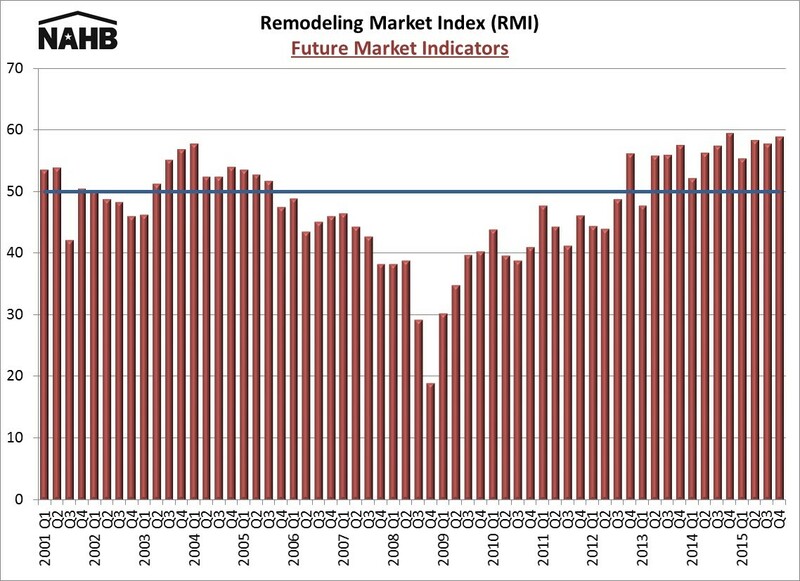 The overall RMI averages ratings of current remodeling activity with indicators of future remodeling activity. The RMI’s current market conditions index stood at 56, unchanged from the previous quarter. Among its components, major additions and alterations, the slowest-recovering component, rose to 54 from 52 in the previous quarter. The smaller remodeling projects decreased one point to 56 and the home maintenance and repair component of the RMI remained constant at 58. At 59, the RMI’s future market conditions index gained a point from the previous quarter. Among its four components, calls for bids and backlog of jobs each rose one point from the previous quarter—to 58 and 61, respectively. Meanwhile, the amount of work committed and appointments for proposals each rose two points from the previous quarter’s readings—to 57 and 60, respectively. 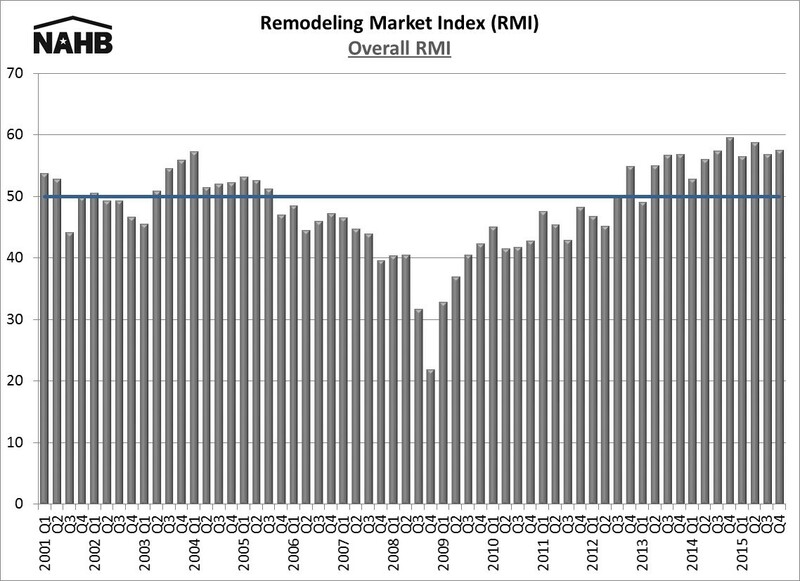 The steady performance of the RMI over the past six quarters is consistent with NAHB’s projection for continued modest growth in remodeling spending. Constraints to faster growth include labor shortages and home owners who are having trouble obtaining loans for larger projects. For more data, including the full history of the RMI and each of its components, visit NAHB’s RMI web page. For more general information about remodeling, see the Remodeling Your Home page.